How many of us have been on a road trip? I'm sure there is a plenty of people have done that at least once in their life. Sometime it could be with family or friends, even going for a quick trip alone which may be fun, but mostly, people decide to rush for business purposes or something like that. We all know that we should enjoy it because sometimes it can be a short or long way to arrive at your destination, either way, we need to relax and drive safe. Did you know that I've never slept on a road trip? no matter how long or short it is because my body can't rest in moving objects like the car while driving. You may think when I sit in passenger, I would fall asleep but its the opposite, the driver sometimes comes to a point which he will drive while about to close his eyes and I still haven't closed one eye haha. Once I was on a family trip, and at that time, everyone slept except my little brother which is like 2 years old and me. I'm going, to be honest, Kids sometimes can be funny and entertaining on times like this, especially, when they had a good sleep because they will have a lot of energy. Me and my little brother we chatted and played with toys a lot which was so much fun haha. However, when everyone is awake there would be a lot of things going on while driving on the road to the destination. I thought it would funny to share some of the stuff that happened to us some of the road trips we had and hopefully, it will bring a laughter to you. Also, make sure to share your most funny moment. Sometimes we like to use headphones to listen to music when there is nothing to listen in the car or maybe you want music different than what is currently playing. I think from perspective remembering that turning up the volume every second so you won't listen to anything but your music is kinda funny, haha and I have done it before. 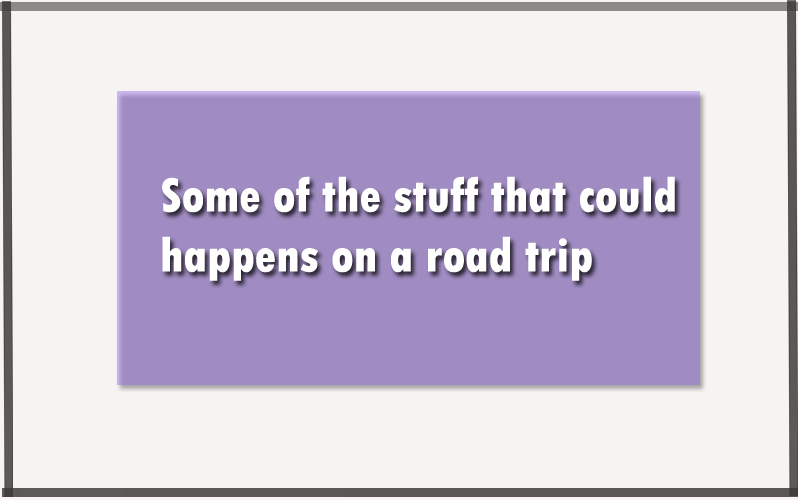 The more people on the road trip, the more choices will be on the list because we have different taste of music or favorites. I can imagine how funny it would be funny to put a playlist of everyone's favorite and start playing it one by one. Each person has to dance when it's played and we line up haha, that would be dope to do on a long road trip haha. It would be somehow impossible to rest fully and sleep when there are other people that are not going to sleep too. My brother was tried and wanted time to rest, however, I was next to him holding my apple juice trying to drink a sip after a few seconds because I didn't want to finish early. My other little brother hit my hand and made me pour a little bit on his face and clothes, haha and he woke up mad trying to figure out what happened to him. I was like 'Thank you for helping me out little bro'. My sister started laughing at my brother's reaction. When traveling on roads, you can't guarantee that you will arrive while being clean as you got in the car before leaving haha. This is always something I tend to put on my list 'to think of before going on a road trip'. Sometimes, when I have a drink and trying to relax while drinking it slowly and carefully, whoever drives will hit the break suddenly which will make our body to react based on how hard it was and that might help you finish the drink on your clothes haha. We stop several times on road trips for food and other stuff. However, once I traveled with my cousins and friends, we had to stop a lot of times because they were eating too much haha. Eating and drinking a lot is something I stopped doing a long time ago when I was a kid because it always causes my stomach pain. I don't think if there more than two people sitting on the back of the car on a road trip would be suitable for sleeping. I was talking to my friend and we were joking and laughing hard which made my other friend peak with almost his eyes closed trying to join our conversation haha. I looked at him while he was doing it and he just started laughing and he was like 'Dude, I couldn't sleep because that was too funny' then he joined us. Most of my family have iPhone except my dad he like Samsung a lot, although, he might change it later and we were going on a road trip vacation. A friend of mine called me and my phone was in my pocket, we paused for a second looking at each other figuring out which phone is ringing haha. This happened to me more than once and it is funny how they react. A lot of things could happen that is funny and these are just a few of what happened to me on my old road trips. I'm sure there will be more in the future which I will be sharing it on here too and in a better way haha. It's doesn't have to be a group, maybe a solo road trip could be so funny that I did because I always drive slow and enjoy the road. I would say that is a wrap for this post and the road trip funny moments. As usual, I don't like to share so many stuff because I think that would be a little bit too much and boring. I want to split time and hear what you guys have of funny or a good stuff you did on the road trip you went on. I hope you enjoyed and I will be back in the next post, till then please stay happy and have a good evening on Wednesday. I love road trips - we've done a couple in the last few years... and they're always an adventure lol! I do like road trips but after a certain amount of hours, I am totally over it. My husband and I did a mini road trip on Sunday, coming back from Thanksgiving weekend and well, what was supposed to be a 4 hour drive, turned into a 9 hour drive. Now if we KNEW we were going to be driving 9 hours, that would have been a different story, but alas, we did not! I don't sleep often in the car, either. My family road trips at least once or twice per year. It's a 17 hour drive from where I live to visit my family, and we do that drive every summer. We just go straight through. We just did a 9 hour drive for Thanksgiving and that felt like nothing compared to the normal drive! I love roadtrips. I sleep in the car when I am exhausted but normally I jam out with my husband. We just got in car dvd players for our son so he can have something to entertain himself while we roadtrip somewhere! My last road trip with friends was to Toronto, Canada. It was a joyful drive until our car lost a tire and we almost got killed. Road trips are not my thing even though I love driving a lot. I enjoyed your stories. I love road trips. Fortunately, I can easily sleep in the car. It helps when we’re traveling a long way. I can’t fall asleep on road trips either! I want to see everything around us, the scenery, woods, road, buildings. Road trips are among my most favorite things out there. I think you can learn so many different things while you are out there on a road trip. And you learn so much more about yourself. I always love a good road trip. There is so much you can learn about yourself through one. So important.